Jason Becker suffers from Amyotrophic Lateral Sclerosis (ALS). A fatal condition with a life expectancy of maybe five years. He was diagnosed in 1989 at 19 years old. He is still cranking out music to this day! He was and still is a six-string slinger with plenty of energy to create music, his personal testament to the power of music and positive thinking. He never stopped working. I think that is the reason he is still with us today, he never gave up and feels empowered to make music on a very high level regardless of physical limitations. The man also has a great sense of humor, he released a documentary on his life in 2017 titled I’m Not Dead Yet. In the video I have provided, which runs over 9 minutes, gives a good overview of how people in the music business feel about Becker. Everyone is filled with respect and admiration for this man and for good reason. I actually interviewed Jason in 2001 in regards to the tribute album Warmth In The Wilderness II on Lion Records. At that time, I had asked what he would like to do next and he said “I haven't thought about it lately, but it would either be a symphony or funky and possibly devotional stuff. Whatever there would be lots of guitar on it.” So here we are in 2018 and we are on the heels of the new release Triumphant Hearts. It looks as though those thoughts and expectations have been realized with the new release. It is pretty cool that I go that far back with Jason and I had the opportunity to interview him. So, guitar fans get ready for one amazing onslaught of guitar magic on Triumphant Hearts. The first song to be released from the album is the 9 minute and 5 second instrumental “Valley of Fire” (check out the video provided). The song features The Magnificent 13 – Steve Vai, Joe Bonamassa, Paul Gilbert, Neal Schon, Marty Friedman, Michael Lee Firkins, Mattias IA Eklundh, Greg Howe, Jeff Loomis, Richie Kotzen, Gus G, Steve Hunter, and Ben Woods. That is one phenomenal line up to put together on one track! It works very well for having that many guitar players contribute. Actually, I am surprised it did not go any longer than 9 minutes and 5 seconds and I am sure it could have with all that talent available. There is a lot of orchestrations in the tracks which makes the listening experience rich and full. Jason composed all the music and he gets his work done by controlling a computer with his eyes. The technology that is available today is truly amazing and because of that we still have the opportunity to hear this amazing artist and his creations. For all of the rockers out there, be patient when popping the CD in because the first track may give you the wrong idea of what you are about to hear. It is classical music but just wait, things really getting rolling after that. The mix of instrumentals, mainly guitar parts, and tracks with vocals, is just what the doctor ordered for my music tastes. There is a boatload of ear candy on the longer tracks like the aforementioned “Valley of Fire” and “River of Longing” and “Taking Me Back.” There actually is only one track under 4 minutes on the entire album, the curtain closer “You Do It,” which last 55 seconds. 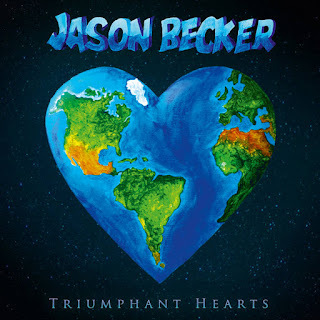 If you are in the mood for some six-string fireworks and want to hear some of the best guitar players in the world on one release, then Triumphant Hearts is your one-way ticket to musical bliss. Hell, you may be so inspired after hearing this music that you will pick up your own guitar and start playing, and if you don’t have one, go out and buy one! 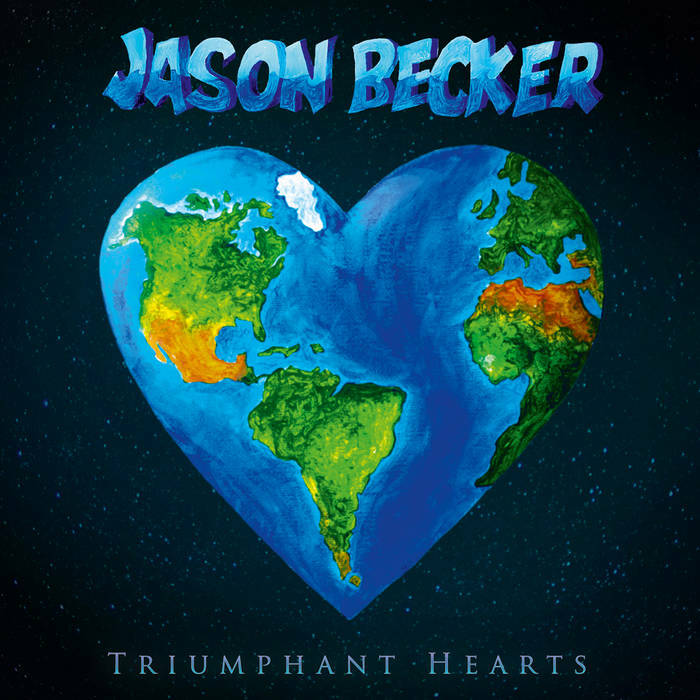 Jason Becker is an incredible human being with a very talented musical mind. Triumphant Hearts is an amazing event that every music fan needs to hear. The man and his music will make an impression on you one way or another, I can promise you that.